Ex-Heck members, Tom Marsh and Matt Reynolds’s, new band Haggard Cat kicks off the final day on the Main Stage. Though there are now only two of them in the band, they still manage to generate just as much noise as before, Reynolds piping layers of fuzzy distortion through the speakers to produce a fat and chunky sound, and Marsh backing him up with hard hitting drums. It’s refreshing to see a band simply plug in and play on the Main Stage which is usually home to various layers of backing tapes and big production; Marsh and Reynolds have played together for so long that they’re naturally in sync, needing no assistance from anything but their conjoined musical brains. The southern rock guitar riffs and frantic pace makes Haggard Cat seem like a British version of ‘68, which is definitely no bad thing. Fans of Heck will be surprised to see Reynolds stay on stage through the whole set, but while he remains fairly contained, he ensures the crowd move around enough to compensate. It’s a fantastic start to the last day and sets the energy levels high. As we enter The Cave to see COVE, we have to check we haven’t got our schedule wrong, as an unfamiliar front man steps on stage to lead the band out, offering only “you may see some old faces and some new today” as the explanation. The set gets off to a laboured start, the bass heavy mix rendering the guitars barely audible and it taking the band a while to warm up before they get into their stride. The band’s newly promoted front man does his part to stir the crowd, asking for some head banging and participation, before the inevitable request for a circle pit comes in. 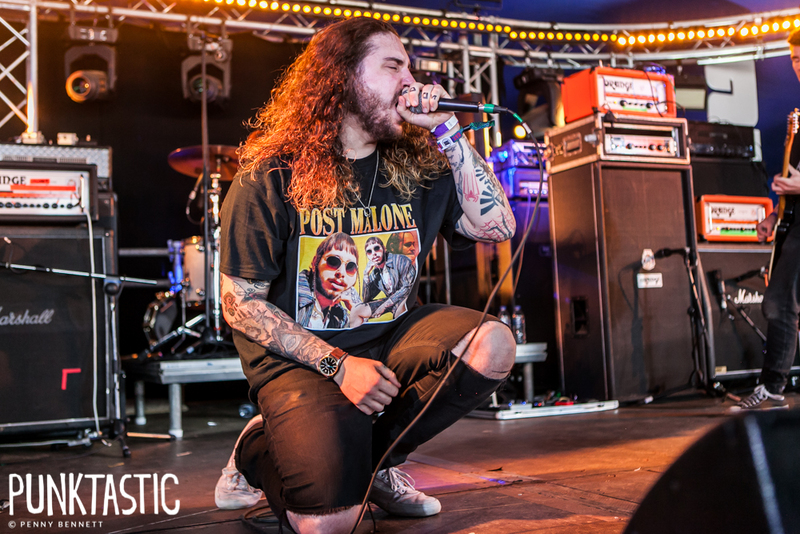 COVE are at their best when crafting heavy riffs to bang your head to, but their limited back catalogue doesn’t have enough of these yet, so the set drags as it goes on. There’s definite potential here though and if this new blood is a permanent fixture, it may inject a new lease of life into the band’s sound. Funeral Shakes are the first band we’ve seen at the festival with a band uniform, the Watford quartet looking well presented in their matching black and white outfits. Their attire gives them a nostalgic look, placing them in a bygone period and their sound is something of a throw back too, focusing on the beautiful simplicity of poppy rock songs that are made to get your feet moving. Their quick tempo, light-hearted tracks are played well and Calvin Roffey and Em Foster harmonise brilliantly to maintain high energy and enthusiasm. 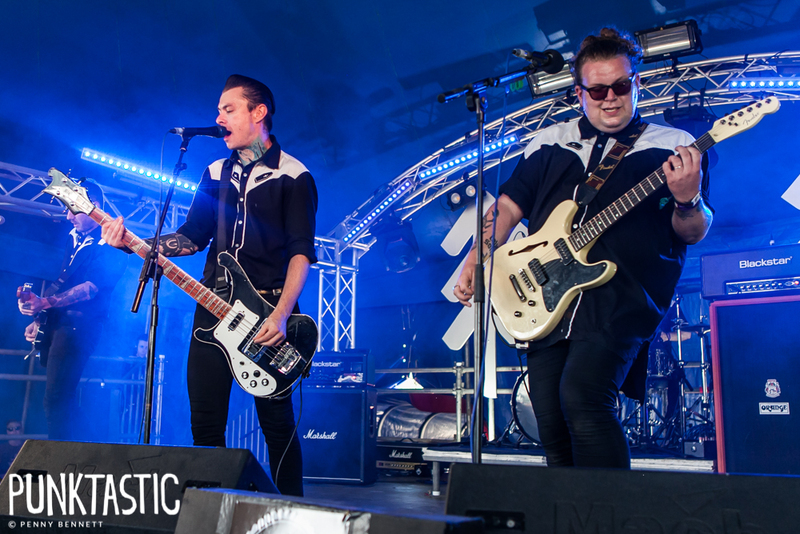 We’ve given their recent self-titled debut a lot of love at Punktastic and this live performance shows why: Funeral Shakes bring a party atmosphere to the Axiom Stage and the foot tapping in the audience says it’s gone down well. On day three of a festival that’s been largely drenched in sunshine, it’s natural for energy levels to deplete and over at The Cave, Woes can’t inject enough of it into the crowd as more than half of the people in the tent choose to remain seated throughout their set. The quintet check off the components of a standard pop-punk formula, with fast tempos, simple chord progressions and dual vocal harmonies, but it’s this later element that lets them down. The vocals are hit miss through the set, often out of tune and out of breath, which sadly isn’t enough to get bums off the floor as the performance goes on. 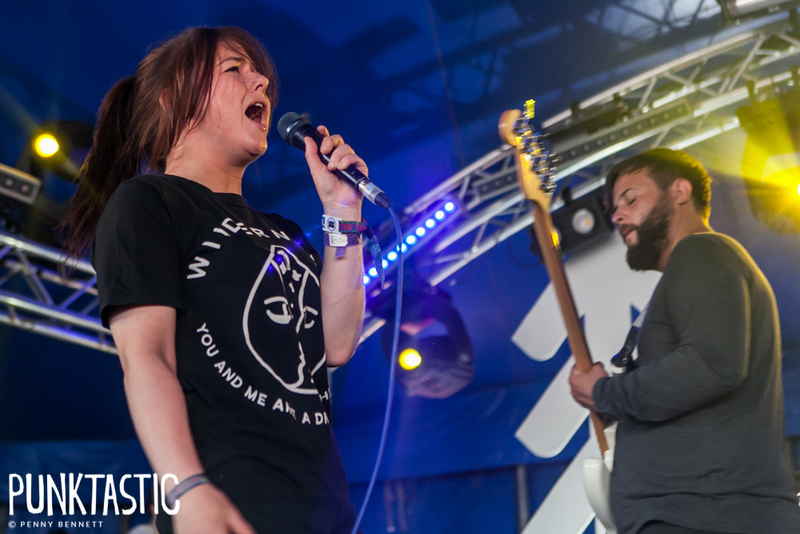 Dream State are having a busy summer; we’ve ready seen the alt-rock quintet at Slam Dunk and Download so far this year, however their festival sets have been so good we didn’t want to miss another opportunity at the Axiom Stage. Sadly though this won’t go down as one to remember as a very poor sound mix leads to an underwhelming performance. The drums are so quiet it’s questionable whether they’re even mic’d up at all, particularly the bass drum which is completely absent from the mix. Guitars and bass overwhelm Charlotte Gilpin’s usually impressive vocals, and when they can be heard they don’t carry the same impact. Dream State are a fantastic live act and this set doesn’t do them justice; hopefully the 2000 Trees crowd will give them another chance next time they’re around. A massive crowd has gathered in The Forest to see Undead Raisins – an acoustic set from Andy and Colin of Hundred Reasons – and in the brief moments that we can hear them, the hype is certainly justified. The issue with providing such a lush and relaxing atmosphere as The Forest is that people enjoy gathering here to chat and meet up, and unfortunately this chatter rarely ceases, even when an acoustic act is playing. As a result, we’re sadly unable to enjoy the music for most of the set, however Colin announces that more shows will follow in November, so we’ll make sure we get ourselves there for a dose of nostalgia at the end of the year. 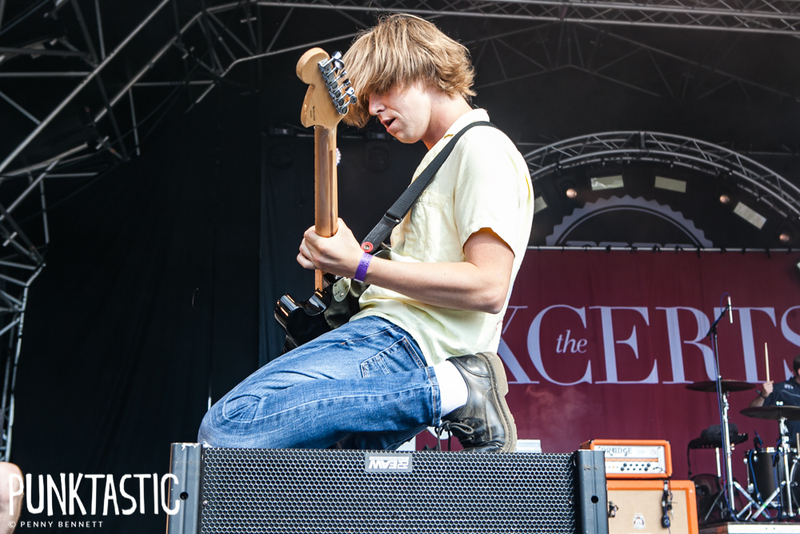 The Xcerts at the Main Stage is always a safe bet for an enjoyable, easy listen, their anthemic pop-rock songs being just what’s needed on a sunny Saturday afternoon. 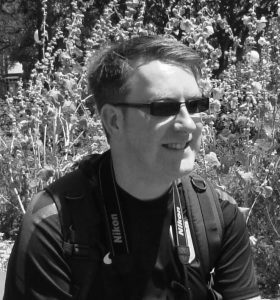 Murray Macleod’s vocals are both beautifully soothing and uplifting, leading his band through up tempo tracks that beg to be danced along to. Macleod pays a touching tribute to Frightened Rabbits front man Scott Hutchinson, who tragically took his own life in May, urging anyone in the crowd who feels like they need help to turn to a loved one. It’s a lovely sentiment that emphasises the strength of the 2000 Trees community. The Xcerts go down a storm, as any band with songs this good should do. In 2016 Basement played to an audience at The Cave that was so full, people were spilling out of all sides of the tent. For their return this year they’re deservedly upgraded to the Main Stage. 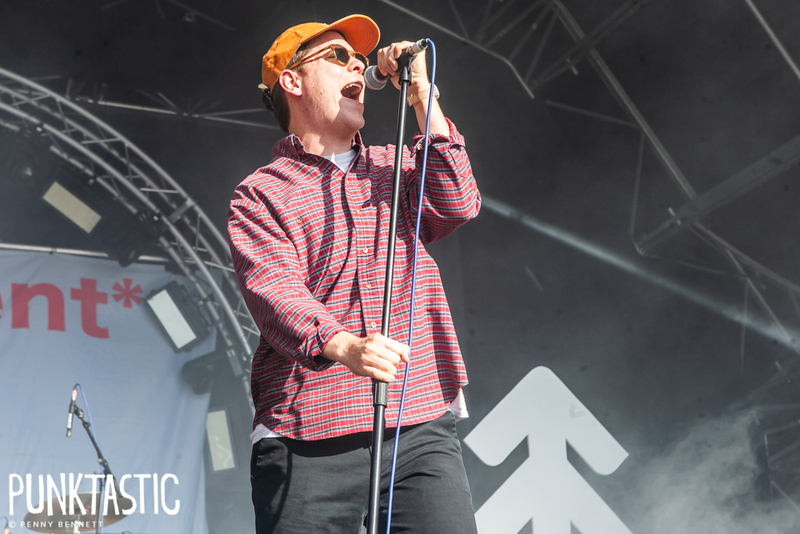 Like The Xcerts before them, Basement provide a stream of easy listening, crowd pleasing tracks that move along at a good pace, providing a satisfying tempo for dancing and moving around. Andrew Fisher’s vocals are a little shaky in places but for the most part it’s an assured performance, one that the band themselves look to be enjoying and this sensation filters down to those gathered before them. Penultimate act of the festival Gallops leave it late in the day to make their claim to best set of the weekend and after this absolutely stunning performance, they’re definitely up there with a good shout. The three-piece utilises more equipment than your local music shop can hold, but through the course of their instrumental, electro-dance-rock hybrid they put it all to spectacular use. Loop pedals, synths, drum machines, samplers, plus the mundane basics of drums and guitars, combine to feed the audience a ceaseless stream of insatiable grooves that has the whole tent dancing for what must be one of the best reactions to a band this weekend. As soon as Gallops finish their inspirational set, a mass of people make their way towards the Main Stage in anticipation of final headliners Enter Shikari. The band are not short of admirers, nor the back catalogue to satisfy them all, and as they make their way through their set, the crowd laps it all up, singing back every word. 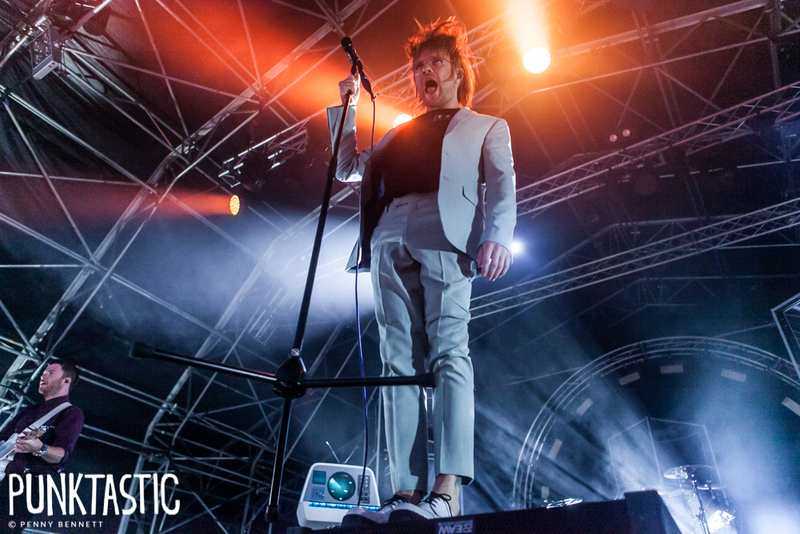 Enter Shikari have risen in stature considerably since their first record and now with the release of their fifth, they’re able to invest some of their success into the production of their live shows. 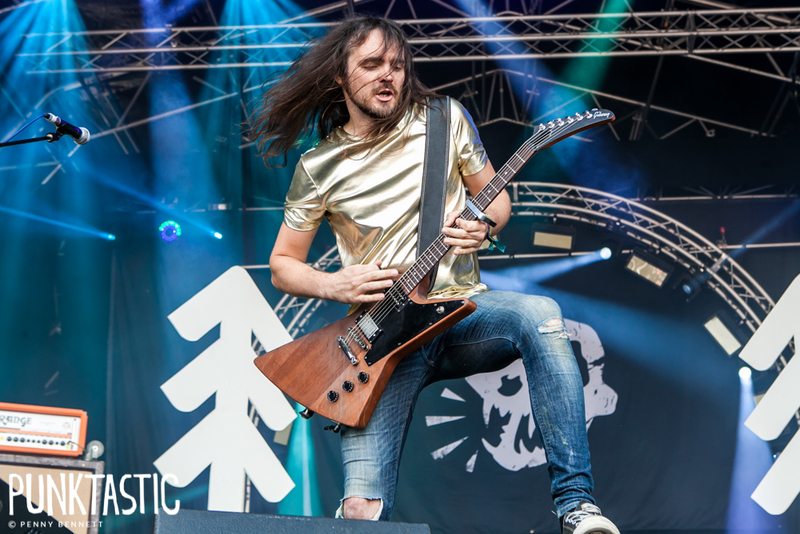 Featuring some fantastic stage lighting and atmosphere, alongside a massive sound, it’s a gigantic performance that brings a satisfying end to another excellent event at 2000 Trees.